John Lewis reported this week that its sales in the five weeks to the end of December rose by 13%, while online sales rose by a massive 44%. In fact online sales now account for a quarter of the retailer’s total sales and reached more than £800m for the year in December. However Boxing Day eclipsed the previous two days to become the busiest day ever for online retail. UK consumers spent 14m hours online and made 113m visits to online retail sites, an increase of 17% from 2011. Experian’s stats show that early discounting was one of the key reasons for the increase in visits online, with one in every 125 searches conducted in the UK including the word ‘sale’ or ‘sales’. Affiliate Window’s mobile and m-commerce figures from December show that 14.72% of all sales were through mobile devices (including tablets), up from 12.3% in November. Overall 19% of traffic came through mobile, up from 16.29% in November, with smartphones accounting for 11.11%. Mobile traffic converted at 4.37% - up from 3.89% in November. Digital sales of music, video and games exceeded £1bn for the first time in 2012, according to theEntertainment Retailers Association (ERA). With a final year-end tally of £1.033bn, digital sales of music, video and games grew by 11.4% over 2011 to account for a quarter of the combined entertainment market. Disc sales of CDs, DVDs, Blu-ray and videogames still account for just over three quarters of the entertainment market, despite falling by 17.6% compared with 2011. In the old days the best way to get in contact with MPs was to write them a letter, but now it seems that Twitter might be the most effective communication tool. A new survey from the Digital Policy Council (DPC) shows that 75% of the world’s heads of state have a presence on Twitter. The study evaluated 164 countries and found that 123 of them have a head of state that is on Twitter, compared to just 69 countries in 2011. Next has announced that its sales from 1 November to 24 December increased by 3.9% year-on-year, largely driven by an 11.2% surge in online sales. The retailer expects profit before tax of at least £611m for the full year ending January 2013, a year-on-year increase of 7.1%. 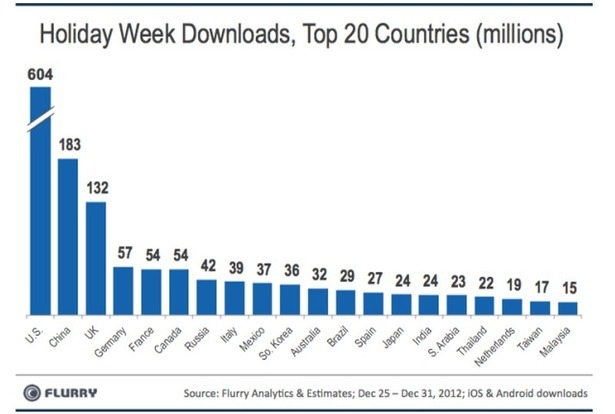 New data from Flurry shows that smartphone owners downloaded a record 1.76bn apps between Christmas and New Year’s Eve. In comparison, the same week in 2011 saw 1.2bn apps downloaded, meaning the increase was around 65% year-on-year. Flurry also estimated that there were 50m iOS and Android devices activated over the last week of 2012. Wikipedia has announced the most viewed pages of the year, with the most popular page proving to be Facebook (32.6m views). Wiki came second with 29.6m views, followed by Deaths in 2012 (25.4m), One Direction (22.3m) and The Avengers (22.2m). Ecommerce sales in China are due to more than triple during the coming three years, according to Analysys International. It has predicted that B2C online transactions will be worth RMB785bn in 2013, compared to RMB470bn in 2012 and RMB240bn in 2011. The amount spent online is predicted to increase to RMB1.2tr in 2014 and RMB1.6tr in 2015. Amazon has revealed that sales during the holiday period from third-party merchants in its marketplace were up by 40% year-on-year in 2012 compared to 2011. The ecommerce giant also reported that 2012 was its biggest holiday season ever with over 26.5m items ordered worldwide on its peak day, which is a record-breaking 306 items per second. Also on its peak day, Amazon’s worldwide fulfilment network shipped over 15.6m items across all product categories.